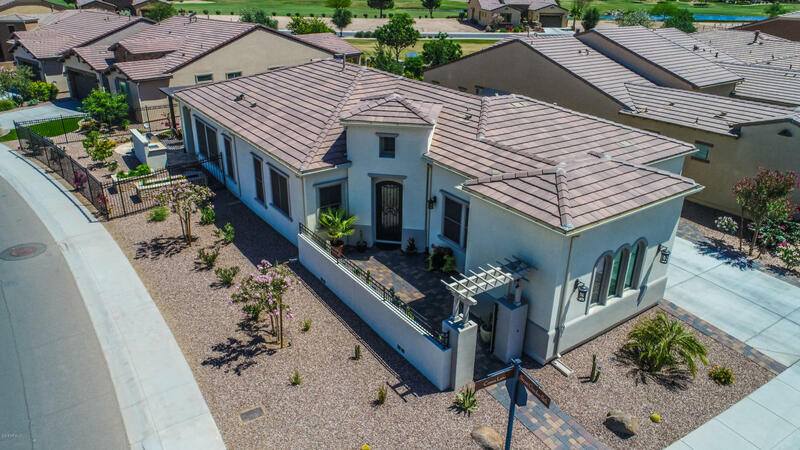 Absolutely stunning Captivate model with a 3 car garage on a premium lot, appointed with every desirable builder option available including extensive upgrades after build. To duplicate this home today would cost over $570K. This home offers a gourmet kitchen w/upgraded cabinetry, under cabinet lighting, custom tile backsplash, SS Monogram appliances and pull-out shelving. Quartz countertops throughout the home in kitchen, bathrooms and laundry room. Custom built-in desk/cabinetry in den, great room and sitting area that includes stone wall, built in wine/beverage cooler and accent lighting. Porcelain tile flooring throughout with carpet in bedrooms. Bathrooms display designer tile upgrades with surround sound in master bath. Step outside to a fully fenced custom backyard oasis with water feature, pergola, built in gas BBQ, surround sound, travertine patio and custom organic garden beds. Start enjoying the Good Life today!